A female competitor breaks down in tears directly in front of me as together we nervously wade into the water at Port Macquarie just minutes away from the starters gun. Ahead of us; a 3.8km swim, a 180km bike ride and finally a 42.2km run. This is the Ironman. Months of training have gone before us but now the confronting fact that we are about to test ourselves like never before hits us squarely in the face. There is nowhere to hide. We’re all emotional. Most of us, I assume, pee in our wetsuits. Shuffling into the water, we’re soon bobbing around silently in the early light of a brisk Autumn’s morning. 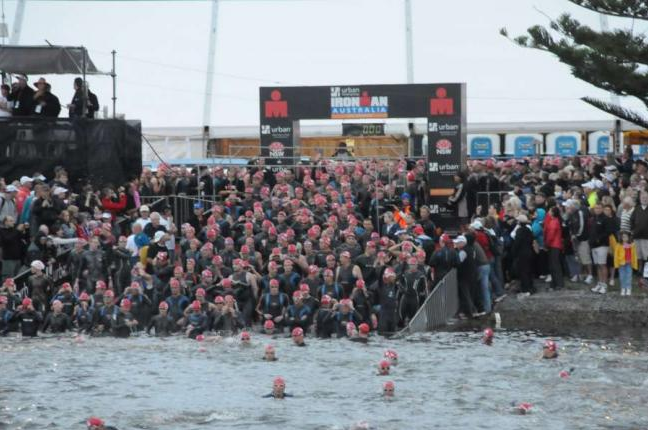 I look around and witness a sea of red swimming caps, each with a race number and the Ironman logo proudly stretched over the heads of 1,600 other competitors. We’ve all chosen to be here. We all want to know whether we can do it but the more I look the more I realize that we’re all different. A seventy year old treads water quietly next to an 18 year old who in turns shares the water with a blind competitor and his guide. Although we’re all about to embark on the same 226km journey (swim, bike and run combined), our reasons are different. For some it’s the first time, for others the fifth, twentieth or more. Without notice, the starters gun blasts into the air instantly transforming the silence of anticipation into a sudden flurry of desperation. Pent up nerves explode as arms and legs wildly flail with each reactionary stroke. Calm blue water turn to white churning water in the blink of an eye. 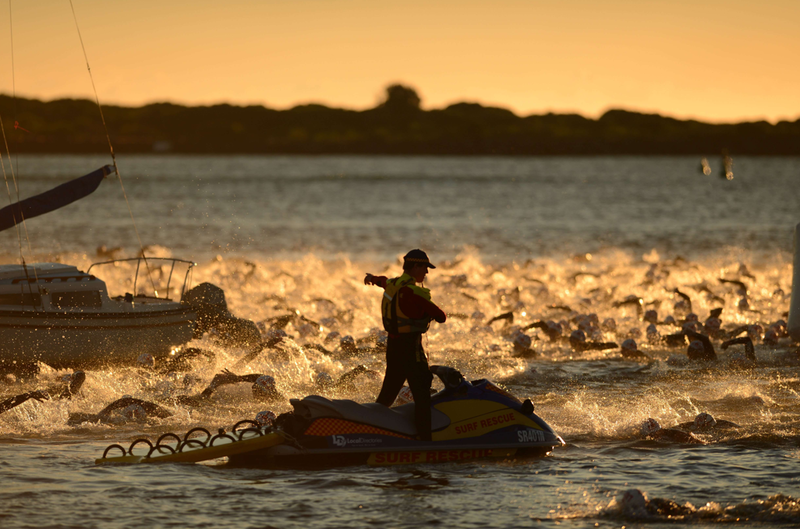 Men and women of all ages and abilities try to clamber over one another in the attempt to make forward progress on the up and down swim leg. The first few minutes of the race must be the wildest. Like migrating salmon heading upstream, the situation is frantic. The hours of swimming laps in a quiet swimming pool for training seem somewhat useless in comparison to what’s happening now. Training in a washing machine would serve us more purpose, surely? Soon though the shorts breaths, long strokes and hard knocks settle as natural swimming abilities seem to stretch out the field into some kind of order. I’m somewhere in the middle but with goggles sucking ever so strongly onto my eyes and my wetsuits rubbing on my neck each time I take a breath, I truly have no idea where I am. I’m already dreaming of getting out the water and onto my bike. In what seems like a battle of the mind, finally some sense of relaxation falls on me as I break slightly left of the main pack and navigate through a quieter channel of boats and moorings. Without people clutching at my feet and kicking all areas of my body, I feel a lot safer too. I make some inroads alone. Circling the furthest turning buoy and edging ever closer to the final straight home I concentrate on smooth strokes. My mind calms again. This seems to be the most important part of the swim for me; controlling the mind. Slowly and without knowing exact distances, the first kilometer naturally turns into the second and at some stage after that, the third. 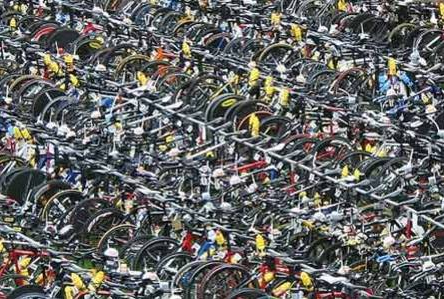 My mind becomes jealous of the professional athletes who are already at the first transition and mounting their bikes on the safety of dry land. This though pushes me ever further. The swim leg, for me, is all about survival, and after an hour and fifteen minutes of swimming I’m happy to say I make it to land. I feel like I’ve just wrestled an alligator- and lost. The realization that I won’t have to swim again though comforts me as I scamper to the transition tent attempting to rip my wetsuit from my body at the same time. In a state of sheer relief but extreme giddiness, this process becomes near impossible and I come close to running straight into a fence. With the help of a committed volunteer though (one of many who help each athlete in the transition tent), we finally get me changed into my bike gear. Nothing it seems will be easy today. I can’t help but think that I should have practiced getting changed in that washing machine as well. On goes my helmet, sunglasses and bike shoes. It’s time to ride. As the saying goes, once you learn how to ride a bike, you’ll never forget it. Riding a bike is that easy. My problem though was that i’d never learnt how to ride one for 180kms and that’s what I now needed to do. Don’t get me wrong, I’d put in plenty of kilometers in training but the psychology of never having quite hit the required distance in one go was now playing with my mind. The one redeeming feature was that I really enjoyed riding and it was this feeling, coupled with sheer adrenalin, that saw me pedal out of town with excitement. That and a pounding heart. I’m fatigued already. The rambunctious crowd cheer us all on regardless and this helps incredibly. Riding a bike, as I’ve learnt, is a phenomenally practical and enjoyable way of commuting. Allowing for a breathtaking views, vibrant scents and the feeling of being connected with nature, it really is something to be enjoyed. The one slightly depressing downfall though is that you have to pedal up every hill (I’ve checked and there is no way around this!). 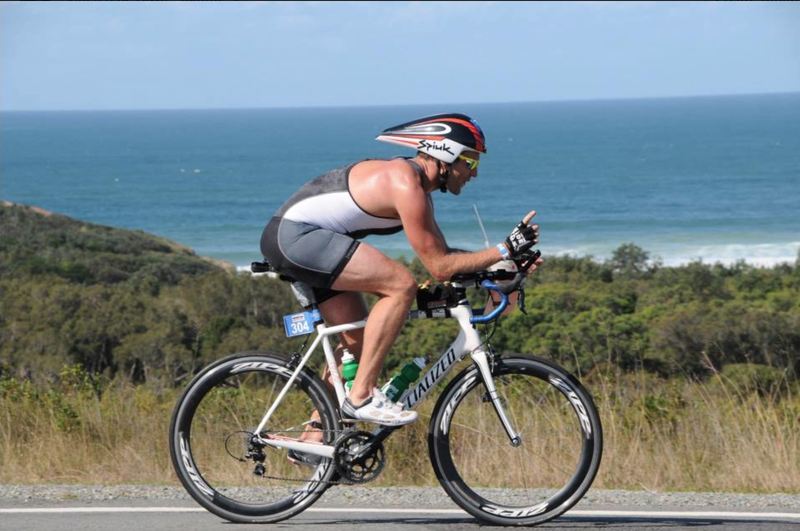 You can imagine then how deflating it was to learn that amongst the beautiful beaches, local forests and supportive locals, Port Macquarie is in fact the hilliest Ironman circuit in Australia. One hill in fact is so steep that the organizers have been kind enough to lay a roll of carpet on one side so that those cyclists who fall off their bike from failing to have the strength to pedal up it, can at least walk in comfort to the summit (dignity though is not guaranteed)! This I try to forget as I pedal down the coast on the first of two, 90km loops. Long rolling hills soon turn into lengthy flat sections and the road surface becomes something of vital importance as my concentration focuses to avoid loose gravel, pot-holes or other imperfections. Wind blowing against me slows my speed considerably and oddly I grit my teeth as if this might actually help. This is a hard section of the race. Bikes of all shapes, colours and price tags become a blur after a while and even though there is a level of competitiveness with those directly next to me, I soon focus internally to check my mind is strong. Thankfully it is; this is what will get me to the end, nothing else. This event for me has never been about competitiveness (which proves to be quite lucky as older men and women occasionally overtake with ease on some sections), the reality is that my own journey is about simply seeing how I react to the challenge. It wouldn’t matter if no-one else was here- I’d still be pedaling. Behind me are plenty of slower swimmers and ahead plenty faster, but much like the natural sorting of the swim leg, those with more ability on the bike soon overtake those who’s bike skills are lacking. I find that I pass roughly as many people on the first 90km loop as those who overtake me. Travelling at an average speed of 30km/h, again I think I’m somewhere in the middle. The infamous carpeted hill looms soon in front of me and with hundreds of supporters lined on either side of the road in fancy dress and holding loud-hailers, the want to succeed triggers a bolt of energy that catapults me out of my seat so that I drive up the colourful hill with all my might. Overtaking struggling cyclists as I charge, I feel brilliant. Surprisingly it seems that my hill climbing is a strength and before I know it i’m at the top before quickly turning the corner and pushing down the road some more. Moments whizz by at speed and without having to walk the carpet my dignity is still in tact. Mirroring the first, the second loop sends us along the same stretch of long beaches and even longer roads as we again head out towards to the base of a distant mountain looming on the horizon. Some three hours into the ride now, the battle between adrenalin and pain management is becoming more vocal. Strangely it’s at this moment that a wave of euphoria strikes me without warning. I realize that even with aching legs, a panting breath and a complete unknown of what’s around the corner, I’m exactly were I need to be- testing myself like I never have before. Will I finish the race? I don’t know. A smile spreads involuntarily across my face no doubt causing passing riders to look at me strangely. I take another sip of sports drink from my bottle and squirt some form of liquified food in after it. Nutrition is crucial for the endurance. Jamie and Duncan are two friends of mine who I trained with for 9 months leading into this event. They are both great blokes and awesome athletes. Duncan, a first timer like me, is quick. His wife, Pip, is following his progress online from home. She is ready to give birth to their first child and Duncan is ready to run straight off the course and directly home should an emergency beckon. 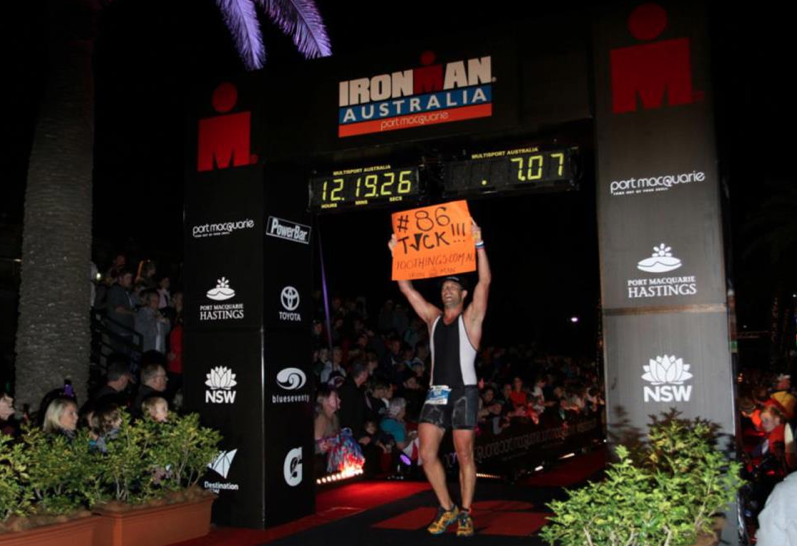 This is his last chance for a while to attempt an Ironman. We cross paths at one stage of the ride and I yell in exhilaration- he’s doing well. Jamie is a 44 year old, 13 time veteran of Ironman. He is even quicker. 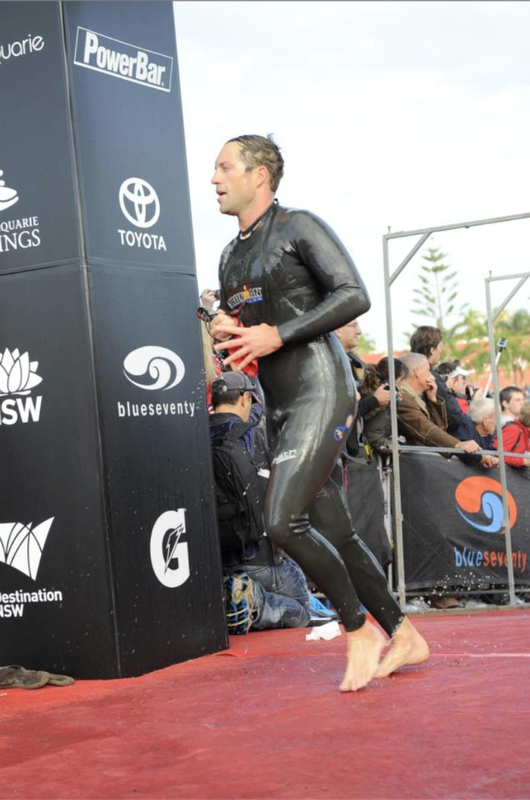 An incredible athlete of ironman, it Jamie’s mental perspective that makes him so special. He’s on the path to qualifying for the Hawaiian world championship of Ironman. He tells me before the race that this year is a warm-up for next year where his aim is to peak. He hoots even louder than me when we cross paths hours later. He’s on fire and looks as though he hasn’t even broken a sweat. Meanwhile i’m leaking like a broken radiator. 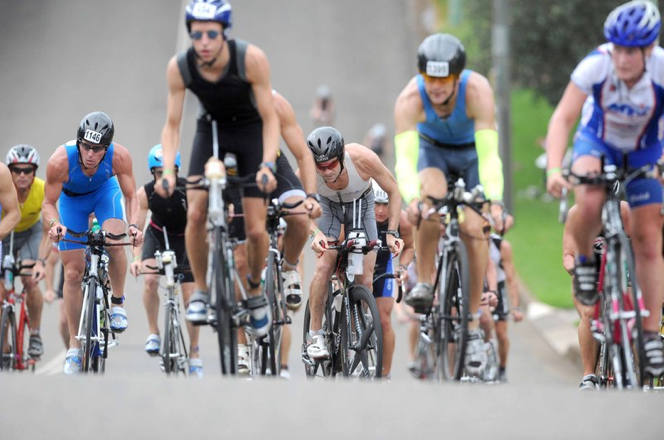 The only thing rivaling the hills at the Port Macquarie Ironman are it’s incredible supporters. Traced on the edges on most sections of the course, the simple clapping and yelling of your name from a complete stranger was something I was told would make a telling difference on the day. Fatiguing naturally on the second lap, it’s the young kids, the drunken university students and the devoted elderly couples who stand side by side that help me carry on at pace. I feel like I’m making friends without speaking to anyone. Occasionally I smile and wave. I wish I could stop and chat. At the same time I can’t help but think that the same feeling must be ten-fold for the slower competitors who after five or more hours of cycling are only half way on the bike route. We are not all athletes, the majority of us are Mums, Dads, brothers, sisters , sons and daughters, all just having a crack. It’s beautiful. Over a further three hours of cycling, I make it to the end of the bike course in six hours flat. My legs are of course tired but it’s my mind that feels the most exhausted; I’ve been doing so much thinking. Aside from pedaling there isn’t too much else to do. It’s a rare opportunity to sort out mental clutter. Jamie told me this is one of the reasons he love the Ironman- to gain perspective. Although tired, I can see what he means. 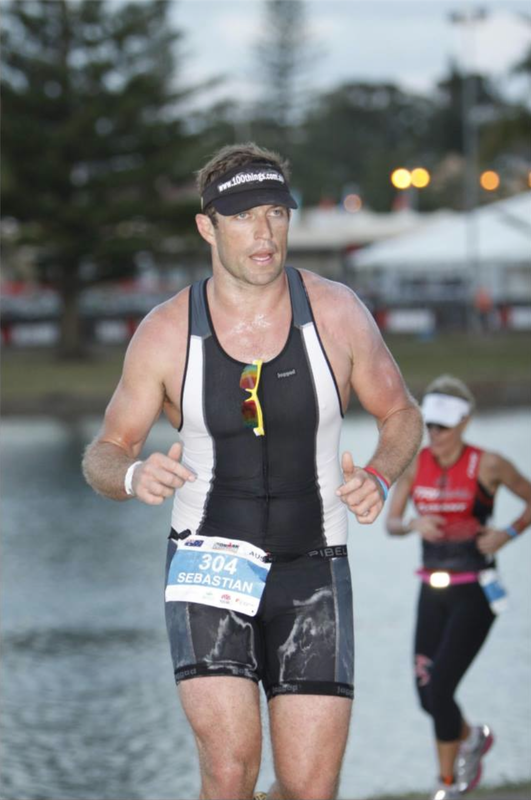 This Ironman is not so much about the grueling physical challenge as it is about the mental strengthening. For now though, the incredible periods of getting into a low riding position and thinking are over. Although all my body yearns for rest (if not sleep! ), there is still one more thing I need to do as I head to the transition tent for the second time- that being the final leg of this event, a casual 42.2km run. A distance I have never run before. Now 7 hours and 15 minutes into the Ironman, the relief that i’m over half way is short-lived as the reality of a full marathon now stares at me bluntly. I’ve never ruin this distance before. Dismissing any form of injury, insufficient nutrition or mental collapse though, I can for the first time see the line ahead. Can I do it? Dumping my bike into the invaluable hands of another volunteer I stagger off to the transition tent and slip somewhat ungracefully into my running shows. Replacing my bike helmet with a visor, I quickly throw as much food and drink into my mouth as I can before standing up and taking the first step of this last lengthy leg. The result; instant pain shoots through my tired muscles. This is going to be hard. Perfect! Four laps of a coastal 10km loop was something that played mentally on me before the race. I’ve always liked the practicality of running from point A to point B. Running four loops in comparison seemed wasteful. The truth is that running for me has always been a slow endeavor and by the time I head out of town, up a large hill and along the heavily crowded beach wall, I’ve been overtaken by what seems like everybody. My chest is tight and lumbering like a large ape through the first of many aid-stations, I pick up a drink and a banana forgetting momentarily how tricky I find it eating whilst running. My face is instantly covered in sticky liquid and squashed banana trails behind me. My mouth is largely empty. Ten kilometers has never seemed so long as after what seems like a good 45 minutes of running I see a 6 kilometer sign. Is that it!? Although my knees are aching, I know it’s my mind that needs to remain strong so I try to zone out of reality, hoping that an inbuilt autopilot allows me to drift 10 kilometers further down the track without me realizing. One kilometer later I give this idea away- it’s not working. I need to be present. At the end of each lap we’re given a colored band to show that we’ve completed a full circuit. A blue band is placed over my sweaty hand as I pass through the official lap-end for the first time. It’s a huge moment of happiness that’s followed quickly by a moment of horrible truth; I still need to earn another three bands before I can head towards to the finishers chute which sits a few hundred meters further along the course. 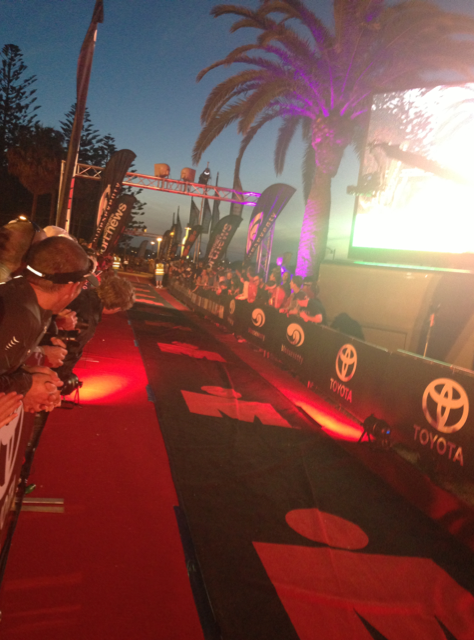 The finishers chute is a 100 metre stretch that leads to the elusive finishing line for Ironman. Until you’ve collected all four bands, you have to agonizingly run straight past the chute on each lap, merely glimpsing down it’s length at what could be. Adorned with a red carpet, thumping loud music, an energetic MC and a vibrant grandstand of families and loved ones, the arch way represents the realization of everyone’s dream- to complete an Ironman. It’s an idyllic place that although a long way away for me, I can’t help but think of continually as I run. It is my purpose- nothing else matters. I get emotional thinking what that finishing feeling must be like. If Luke can do it, surely I can, too? Lap 2, in a very similar way to lap 1, starts off slowly. Meandering through a tight street and past thousands of screaming supporters, I fain energy by giving a thumbs up and on occasions muttering ‘Thanks!’ to friendly strangers. They deserve much more but i’m struggling. Seeing family cheer me on, my own girlfriend screams my name as if I’m as quick as Luke Bell. Clearly this is not the case. Again it’s a reminder that this race for me is nothing to do with speed, it’s the principal of finishing that matters. The second lap starts to take it’s toll on many runners. Now being passed less, I feel that I’m making good in roads as some around me start to walk or even stop. One man leans against a lamp-post vomiting as a day of being in the sun takes it’s toll on another who is passed out on a grass verge. Medics surround him and I’m reminded to continue to eat and drink at each aid station. I do my best. It’s messy. A second wrist band, this time red, soon finds it’s way onto my wrist and it’s on my third lap that I start to believe that my dream is within reach. Twenty kilometers left and I cross a bridge realizing that the sun is dipping over the horizon. Within minutes day turns to dusk and quickly again into night. It’s now black and we all continue on with a shared goal. Of all the names I could hear, it’s my mates Jamie’s that perks me up as I brave another bout of shooting pain, this time in my ankle. He’s done it; crossed the line in what must be a great time. My time will come I tell myself. As the night draws on it’s moments like these continually bring a smile to my face. At one point I contemplate the danger of running in the dark before then seeing, for the first time that day, the blind athlete and his guide running. I change my line of thinking and feel stupid- it’s always dark for him and he’s not complaining. This guy is a hero- wow! He uses no excuses. I plod on feeling great that there are people in the world like him. My blue and red bands are soon joined by a third black band and as I pass the finishers chute for the last time (without being allowed down it! ), I happen to see Duncan cross my path at the same exact moment. On his wrist are four wrist bands- he’s on the way home! As we pass each other I witness the very moment that he realizes that there is nothing that can stop him from reaching the finish line. A look of determination is replaced with sheer joy. His smile beams instantly and we manage to high-5 as a way to celebrate his moment of glory. I smile too but have to continue running as I fear that stopping to watch him may give my legs the excuse to stop operating for the day. I’m elated for him. I’m still one entire loop away from finishing but I know I’m near. I just have to focus. I start clapping for my triumphant mate and steal his smile for a brief moment. With conversations and thoughts bouncing around my head, the last lap seems to be the most important of them all. Clarity slowly moves into the forefront of my mind as aches and pains drift away. I can do this. Although slow, my pace seems to have been fairly consistent. Promising myself that I would never stop, I’ve made sure I’ve kept going. Strangely this mindset now means that I’m passing many now who limp, stagger and even crawl. It’s human persistence of the utmost degree- no one gives up here. With the scent of success in the air, a sign passes me that says 40km. Exhausted, I try to make sense of what it means. Maths seems impossible at this stage and I assume that surely I’ve miscalculated something and that I indeed need to complete another full lap. I only have two kilometers left to run!? Passing the lap-end, I’m given the final white wrist band and this can only mean one thing; I’m now ready to run down the finishers chute! Without prompting (or making a conscious decision to do so) my legs suddenly decide to move faster. As if someone with a remote control was making them do so, they triple in speed. Somewhat awkwardly my body is forced to follow. To an looker it must be hilarious to see. With no more than one kilometer left of the marathon course, I instantly worry that my pace won’t last. It’s too late though- I have no control of this train. Running faster than I have at any others stage in the run, I speed past aid stations neglecting to grab a drink or a bit to eat- my goal is too near to slow down for- i’m literally sprinting! Over the bridge, round the corner and across the slender footpath, I’m suddenly faced with a site that although I’d seen four times previously, it’s only on this occasion that I’m allowed to explore- it’s the finishers chute. I’m here. My goal is imminent. Grass under my feet turns to red carpet and the dull sound of music from afar suddenly becomes deafening. From the dark of night I’m instantly Illuminated under the flood-lights of the chute as I sprint through. Finally I see the finish line just meters away. The crowd scream and cheer as they see that familiar smile of achievement take over my face, but I know they’re not screaming for me, they’re screaming on behalf of everyone who’s dared to test themselves today. In fact no, they’re screaming at the notion of human endeavor. It dawns on me that although this Ironman has been one of the hardest things that I’ve ever done, it’s got nothing to do with the swimming, the cycling or even the running. The key is throwing all your energies at pursuing a goal that’s worthwhile to you- whatever it might be. It’s about having a crack. Grabbing it, I sprint the final few metres until I’m directly under the archway of the finish line and hold it straight above my head. I’m euphoric. I let out a scream that’s been brewing for over twelve hours and close my eyes. I’ve never felt more fulfilled than this in my life. I’m certain that I’m a better person now than I was at the beginning of this race. This has been about growth. Life is an opportunity to achieve, no matter what your goal is. Strangely though I don’t think it’s got anything to do with WHAT we do, but instead WHY we do. Whether it’s to show that being blind is not a reason to not achieve. To maintain a dramatic health kick. To honor the loss of a son. To realize a life long dream of competing in Hawaii or to simply test your own mental resolve. We all have reasons and these are just a few shared from some people who I was fortunate enough to meet at Port Macquarie. The key is finding your why. I think my life has changed. 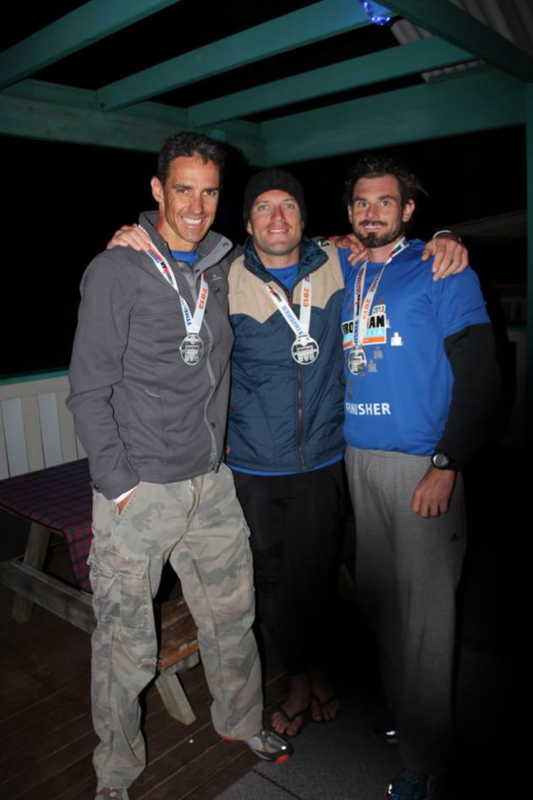 Jamie achieved a personal best of 10 hours and 25 minutes. He dream to qualify for the Hawaiian World Championship is still alive. Duncan finished in 11 hours and 26 minutes and made it in time for his baby’s birth. Nathan, the blind competitor (and his incredibly selfless race partner, Glen), finished the race to a standing ovation.